These days companies are setting up a regular first aid training for their employees by hiring professionals who hold first aid certification. Aligning employees to first aid classes is a great way to prioritize workplace safety and ensure them to properly handle emergencies or minor injuries in companies. If you haven’t yet addressed your company’s first aid kit, it’s a great time now to refresh yourself. Many small companies may or may not be aware that the Occupational Safety and Health Administration (OSHA) mandates that all smaller work offices, and sites should always have on hand a well-stocked, easily accessible first-aid kit for all employees. It’s also a good idea to include information about your local office including written directions for obtaining emergency services, whom in the office holds first aid training, location of defibrillator, etc. Many commercially available kits offer more items than what’s listed above, and some even provides specialized components that meet the needs of certain injuries, like chemical exposure, burns, etc. An important first step is simply having a stocked kit on hand. An important first step is simply having a stocked kit on hand. The kit you maintain for your company should not be placed in a spot that is later forgotten till an emergency arises. They also need to be checked periodically to ensure no supplies have been depleted, and that it’s properly managed. Here are a few good tips for managing your on-site First aid kit. Store the first aid kit in an area that is safe from being exposed to heat, cold or other potential damaging conditions. This can include a cabinet in your office break room away from windows and food storage. Ensure its accessible and that your staff who ideally hold valid first aid training are aware of its location and supplies. Some suggestions for alternate locations include beside the company water fountain, near the entrance door, or beside a common area such as lunch room. 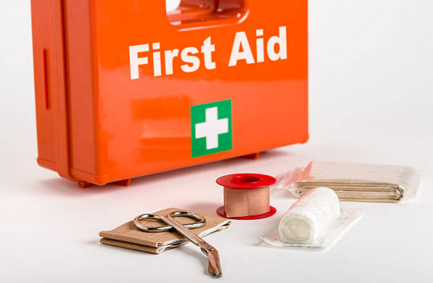 Appoint one of your first-aid trained staff to manage the kit and check it’s supplies monthly. You can consider additions to the kit, such as pain pills and medicines for treating allergic reactions, but inform employees of the risks of using these products upon hire. Having a well-thought out emergency medical plan should also be paramount on your list. All office personnel should be provided training specific to medical situations, so they able to adequately respond to them when needed. This can include simply attending to a bleeding wound to more serious problems including administering CPR. Take into account specific needs for the area you live in, as well as the types of workplace accidents you could potentially be exposed to. For example, those located in hot desert areas would require anti-venom serum on hand, whereas an office in NYC dealing with chemicals would need eyewash stations, etc. The most effective way to keep employees safe is conducting regular safety reviews, training new employees on the location, use of emergency kits on hand, and maintaining the first aid kit at all times. A safe office is a prepared office!